The frontman and lead singer for alternative rock band REM. Stipe has become well-known (and occasionally parodied) for the "mumbling" style of his early career and for his complex, surreal lyrics, as well as his social and political activism. 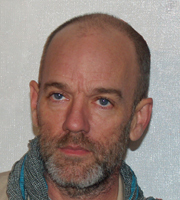 Stipe and the other members of R.E.M. are known as pioneers of alternative rock and are credited with having inspired many of the acts that went on to make up the 1990s' alternative music scene including Nirvana, Pearl Jam and Radiohead.